The Screencast.com output button is already set up when you install Jing, and it's probably the most convenient way to share a capture with other people. How does sharing to Screencast.com work and why would you want to use it? Once you take a capture and click the Share via Screencast.com button, your content is uploaded to your account on Screencast.com and in a matter of seconds you receive a link to your capture. The link is copied to your clipboard, which you then paste into an email, instant message, chat room, message board, Twitter--any place you want to show somebody something. People that click the link see what you captured. The beauty of sharing content with others by using a link is that your content is hosted (privately--more on that later) so there is no exchange of messy large file attachments and you don't have to worry that the viewer will have trouble seeing what you sent them. Your content on Screencast.com is private. It's not like anyone on Google (or wherever) can search and find it. Only the people that have your unique link can see it. You can learn more about Screencast.com and Jing here. 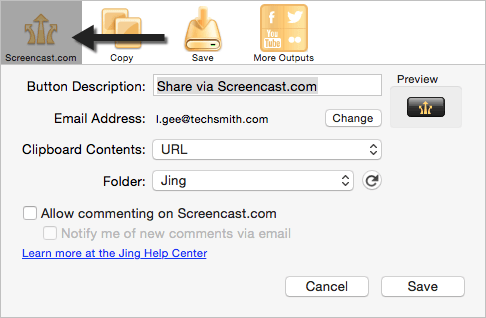 When you send content to Screencast.com, by default it goes into a Jing folder which is "hidden." Hidden folders are special in that the only way viewers can see a particular image or video is if they have the link to it. Viewers cannot see other content in your folder. But what if you wanted viewers to be able to see all your content in a public folder? 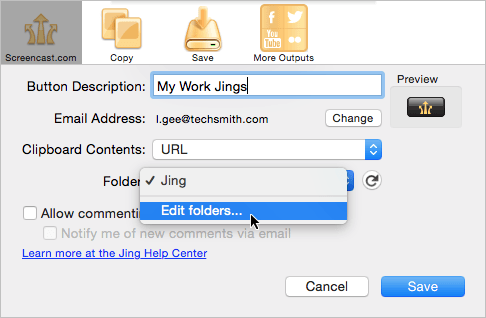 What if you wanted to keep your work Jings separate from your personal ones? You can create numerous folders, set privacy levels, and then make additional buttons in Jing to direct certain content to certain folders. Note: You must be online to create a new Screencast.com folder. Make sure the Screencast.com output is selected. Enter a logical name in the Button description field. This description appears as the tooltip for your button and will help you tell your Screencast.com buttons apart. A good description might be My Work Jings. Your default Screencast.com account is used by default. If you would like to use a different Screencast.com account, click the Change button. Choose URL or Embed Code from the Clipboard Contents dropdown menu. 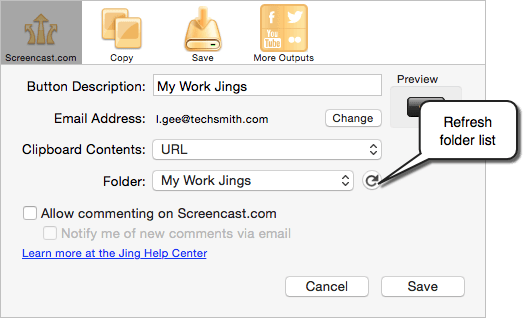 Since you want your work Jings separate from the default Jing folder, you need to make a new folder on Screencast.com. Click the Folder dropdown menu and select Edit folders... You are directed to your account on Screencast.com. Click the Create Folder button. Title the folder. In this example, I might call it My Work Jings. Select the Privacy level. If in doubt, we recommend Hidden. Click Save. Learn more about Folder Privacy Levels. Click Done. There! You have a new folder on Screencast.com. Now we just have to tell Jing to make use of it. Return to Jing and refresh your folder list. Click the Folder dropdown menu and your new folder should appear in the list. Select your new folder. Click Save and close the Custom Jing Buttons dialog box. Now you can make a capture and try out your new button!